Wild Oats is published 40 times per year by Wild Oats Publishing, 958 - 167 Lombard Avenue, Winnipeg R3B 0V3. Tel. (204) 942-1459 Fax (204) 942-7652 E-mail: wildoats@canadagrain.com Information is secured from sources believed reliable, but 100% accuracy cannot be guaranteed. Persons associated with Wild Oats deal commercially with businesses active in Prairie grain markets and may hold positions on their own accounts in commodities discussed herein. ISSN 1185-2194 Copyright 2014. All rights reserved. 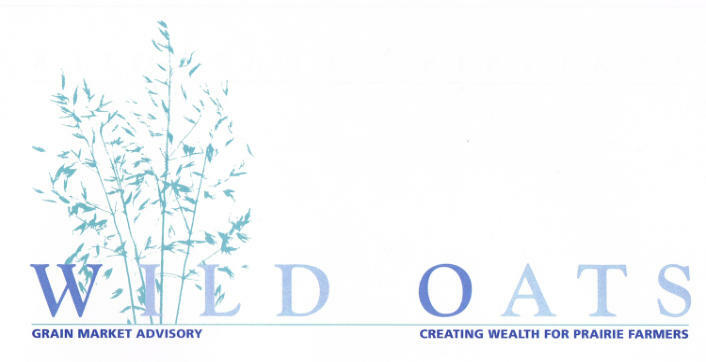 The Wild Oats Grain Market Advisory is protected by copyright. Copying, retransmission or redistribution, in whole or in part, without the prior written approval of Wild Oats Publishing is strictly prohibited. From the Floor Opinion derived from traders Put yourself in the shoes of a banker who has to put large volumes of money to work. You can lend it out in $50,000 loans to new car buyers and collect the revenue in monthly payments over 5 years with all the admin attached. Your collateral is a depreciating car that someone is driving. To place $10 million you need 200 customers that you have to keep in contact with monthly. Or with the same $10,000,000 you can supply operating loans of $1 million to 10 farmers. Farmers are prime candidates for bankers to finance. Almost all farmers own farmland - probably the most secure asset in the world. Plus operating loans are often paid off within a relatively short period and in large payments. You're doing business with a handful of experienced businessmen. Street Smart - Michael Temer The Brazilian government will subsidize a 10% cut in the price of diesel fuel for 60 days. Michael Temer, President of Brazil, attempting to end the 8-day strike by thousands of truckers. Canola Production Uncertain - Jerry Klassen July canola futures made fresh contract highs - trading up to major resistance of $540. The market is incorporating a production risk premium. The canola market will function to ration demand through higher prices. Domestic usage is inelastic and will stay around 9.2 mmt regardless of price; however, this means that the market has to curb exports. Over the past week, there have been timely rains across most of Western Canada but a large area received less than 40% of normal rain over the past 30 days. Longer term forecasts call for above normal temperatures over the next 30 days. Calming trade tensions between Washington and Beijing have supported the overall oilseed complex. China has been buying Brazilian soybeans over the past month but last week, China once again stepped forward for a few cargoes of new crop U.S. soybeans. It’s still very early in the growing season and there is still a long time before the canola and soybean crops are in the bin. Expect significant volatility in the soybean and canola markets over the next couple months. World Weather Drives Wheat Market Higher All three wheat futures markets continue to percolate higher due to the adverse growing conditions in four major regions of the World. The U.S. hard red winter wheat crop is one month behind normal development. Temperatures in Kansas have been above 30 degrees Celsius over the past week with minimal rain. The seven day forecast calls for similar conditions while the crop moves through heading and filling. The crop will experience a sharp year-over-year decline in production. The second major problem area is in Southern Russia where 25% of the wheat is grown. They got less than 40% of normal rain over the past 30 days and the forecast calls for above normal temperatures with limited rainfall. Spring wheat seeding of Siberia and Kazakstan is lagging sharply behind normal due to adverse dry conditions. Russia has been the main player on the export market setting the price. Over the past week, there are no offers for Russian wheat because of the production uncertainty. Spring wheat conditions in Western Canada and North Dakota are becoming a concern. Above normal temperatures have plagued U.S. and Canadian spring wheat areas. Australian farmers are seeding into very dry conditions. The seeding window is quite long but the forecasts call for below normal precipitation. To give you an idea how tight stocks are in Australia, there is talk in the trade that 100,000 mt of UK feed wheat traded into Australia this past week. The stronger feed complex is underpinning the wheat market. The second crop corn region in Brazil has experienced dryer conditions over the past couple weeks and this has lowered production estimates. This is the main corn crop for Brazil and the these adverse conditions are coming on the heels of the lower Argentinean corn crop. U.S. corn fundamentals will be very tight for 2018/19. If the U.S. doesn’t get trend yields, the U.S. corn carryout will drop to historical lows. We continue to forecast further upside in the corn market for this reason. CP Set to Strike CP train operators have voted to go on strike tonight (Tuesday). If you're on a CP line expect delivery opportunities to dry up. Also expect the grain export pace to slow. Finish Flax Sales - John Duvenaud The 2018 flax crop has been planted and generally has germinated. Acreage is uncertain. Anecdotal evidence suggests that Saskatchewan plantings were a bit higher than last year. AgCanada feels plantings will be down marginally. USDA suggests American plantings will be down 15% from 2017. Prices are slowly working their way higher. The Canadagrain.com database shows Saskatchewan elevator bids climbing or flat since last fall's harvest lows. North Dakota elevator bids have been climbing since January, 2017. North Dakota flax has the advantage of being closer to petfood manufacturers and that is reflected in their price. That industry has become an important end user. Western Canadian flax prices are world prices minus the cost of transportation. The United States is less dependant on exports and it's easier for prices to percolate higher. Export demand for flax is broadly flat. Canadian 17/18 exports dropped by 50,000 tonnes from the year before as China is moving their buying to Kazakhstan and Russia. China is still a buyer but not on the scale of even a few years ago. This is often a time of year when surprise export orders pop up due to cropping problems with other suppliers. There doesn't seem to be any special problems showing up these days. Export sales are to regular buyers. The once sizable premiums being paid for yellow, or golden, flax have come down to earth. There's still a premium but it's in the order of 50 cents/bu. The Canadian flax carryout this July will be 170,000 tonnes. That's down from a year ago but still adequate. One bright spot is the smaller Canadian stocks this year. StatsCan reported last week that total Canadian flax stocks as of March 31 were 327,000 tonnes, down substantially from 417,000 tonnes a year earlier. Prices have been easing lower in the past week as more farmers wrap up seeding and start cleaning up old crop. Last week $13/bu fob was generally available in Saskatchewan but today $13 delivered is more likely to be the best you can find. You may have trouble finding $12.50 fob. On the top end you can pick up $13.25 delivered Manitoba for human edible. The big unknown in flax markets is the development of the Saskatchewan crop. If it rains a couple of times the crop will be off to the races and farmers will be wanting to move out the rest of the old crop. There isn't a lot of spare storage in either elevators or at processors and the market could back off. On the other hand... Don't base your marketing on the possibility of a drought. Sell the 5th 20% increment of your 2017 flax completing sales. Flax prices have been in a general downtrend for four years while canola has been trending higher. It's possible that plantings this spring may not even achieve the reduced 1 million acres projected by AgCanada. And even if those acres got planted the carryout next year is likely to be substantially smaller. New crop bids top at $13 in Manitoba and $11.75 or $12 delivered in Saskatchewan. There's no compelling reason to be making new crop flax sales. 2000? It was the new lucrative crop. That was before disease became an issue. Mustard exports are maintaining their levels and the smaller 2017 crop is cutting into carryover levels. Canary shows minimal carryovers but the market suggests there's still quite a bit out there. Seeding Progressing Well Western Canada is 90% seeded with the Red River Valley wrapped up. Most seeds have germinated but not all of them. Dryness is a big concern. American corn planting is at 92%, soybeans at 77% and spring wheat at 91%, all above normal with soybeans substantially ahead. The first corn condition report has corn at 65% good/excellent which is a pretty good crop. China/US Trade War Reheats Last week Chinese and American trade negotiators announced jointly that their trade war was over. This morning the New York Times reported that the White House was again moving forward with tariffs on Chinese imports. Futures Weak After Long Weekend Today (Tuesday) was the first day of trading after the Memorial Day long weekend in the US. Most stocks and commodities were lower, including grain. Political issues are at play in Europe with both Italy and Spain raising concerns. That is weakening the Euro and the flight to safety pushed the UD dollar sharply higher. That's bearish all commodities. Wheats had a great couple of weeks with Minneapolis up 25 cents and Kansas up 46 cents. Russia, USA, Ukraine, Australia and now Canada have developed weather issues in wheat areas. All wheats took it on the chin today but closed well above their lows. Soybeans are mildly higher on a truckers' strike in Brazil. Canola is up a hair on a weaker Canadian dollar.